I had a note from Dennis, who was trying to track down the origins of an old brand of custard powder. He sent pictures of the pack and said he’d tried Google and a few other places, with little success. 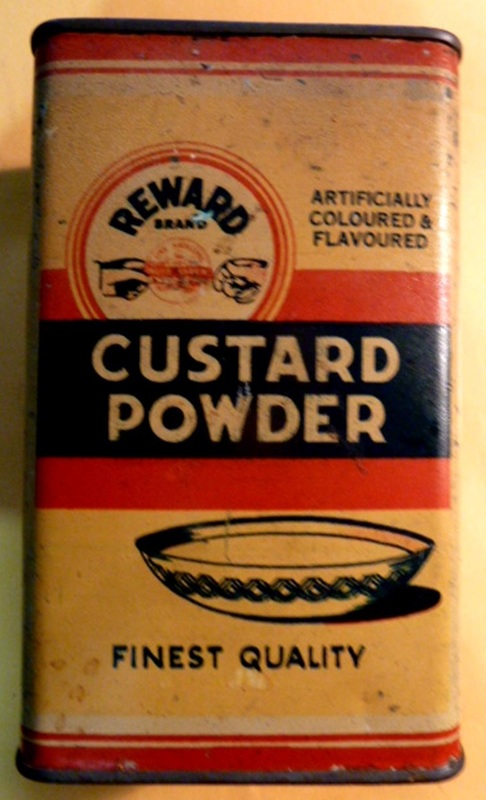 It seems that there were many brands of custard powder lurking about by the early 20th century. Eggless custard powder was invented in England by Alfred Bird in 1837, apparently because of his wife’s allergy to eggs. It was based on cornflour, although other manufacturers subsequently released competitive products with ingredients including arrowroot, sago flour or potato starch, coloured with turmeric or chrome yellow, and flavoured with cassia or bitter almonds. Custard powder was being imported into Australia by the late 1840s. By the 1880s, Borwicks’s Custard Powder was a heavily promoted brand, although Australian manufacturers were beginning to claim their locally produced version was as good as the imported varieties. By 1911, the English Foster Clark’s Custard Powder was being advertised in Australia and in 1918 the company set up a manufacturing operation here. Foster Clark’s became the most enduring brand in this country, producing a range of other products including jelly crystals, junket crystals and other pudding mixes. Which brings us to Reward. After poking around on library and museum sites I came up with a theory about Reward. I think it may have been an early house brand for a grocery chain called Lakins. 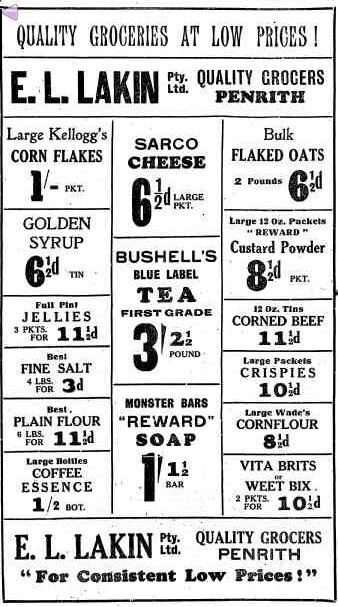 The earliest reference I can find to the Reward brand is in 1943 and I can only find it in association with this grocery chain. 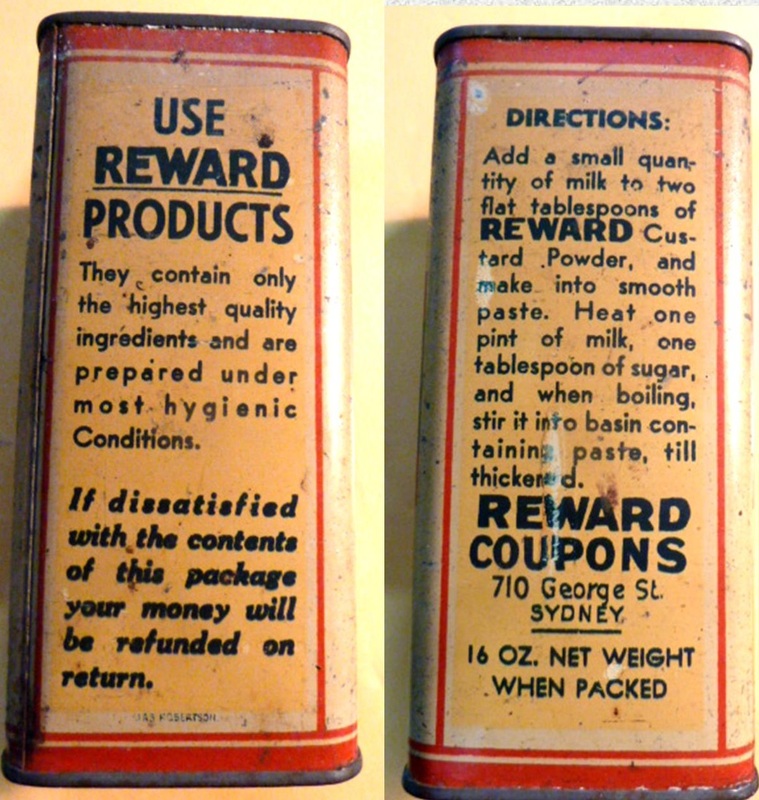 Several references to Reward Custard Powder are made in advertisements for E.L. Lakin Quality Grocers who operated stores in New South Wales. This one is from the Blue Mountains Advertiser in 1946. 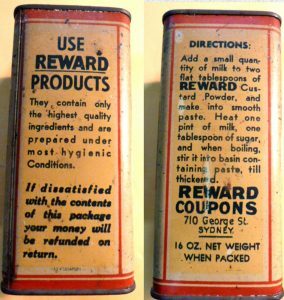 Interestingly, another of these advertisements also refers to ‘Monster Bars’ of Reward Soap. Another refers to Reward Starch. James Richard Fleming, who has died after a stroke at 75, was the son of James Fleming, who set up a modest shop in Mascot with his brother during the Depression. The two men built up a chain of about 20 shops, naming their business after James’s wife’s maiden name, E.L. Lakin. By World War II, the Flemings had amassed 100 shops; in 1956 the chain was relaunched under the Fleming banner, as Flemings Fabulous Food Stores. Woolworths bought the company in 1960, marking its first foray into groceries. My theory, which may or not be correct, is that the brand may have been specially manufactured for their grocery stores. There are other examples of this. For example, Anchor brand custard powder, which was manufactured for G.Wood, Son & Co – a grocery chain in South Australia. Another example is Rolfe Custard Powder, marketed by Rolfe & Co. “importers and grocers in Bourke Street West” in Melbourne. Of course, my assumptions about Reward could be incorrect. But it seems that it was quite common in the past for grocery chains to carry their own brands, a bit like the house brands Coles and Woolworths have today. Since Lakin’s had up to 100 stores, it’s not inconceivable that they would have had the market power to commission their own exclusive lines. If you know more about Lakin’s or about Reward Custard Powder, I’d love to hear from you. Just use the contact form to email me.